Classic Truck Restoration Get'er Done Once; Get'er Done Right! Classic Truck Restoration offers automotive restorations and related services to bring classics, vintages, antiques, muscle cars, and hot rods back to good-as-new standards. With more than 10 years of experience, our experienced, ASE-certified technicians have the knowledge and skill to tackle any restoration job. We understand sophisticated vehicle engines and systems, and our technicians are trained on all the latest technologies to better meet your restoration needs. Our large facility features the best equipment on the market to help our factory-trained specialists provide you with fast, high-quality restorations. From sturdy lifts to advanced tools and computer systems, we easily restore your vehicle back to precise factory specifications. Our goal is returning your vehicle to a safe operating condition and making it look great—a goal we accomplish every day in our state-of-the-art facility. Don't forget to ask about our media blasting services! At Classic Truck Restoration, we believe that our customers are our #1 priority. That's why we provide you with the best in quality and service. Are you in a hurry? No problem. We offer fast and friendly service without sacrificing quality. Need a reasonable quote? No problem. We provide you with a free and fast, no obligation estimate! We even welcome fleet accounts. Classic Truck Restoration is your #1 choice in automotive restorations for trucks. Pick up and delivery is available. 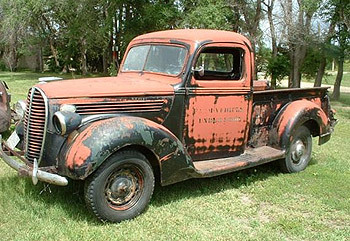 on our automotive restorations for trucks!